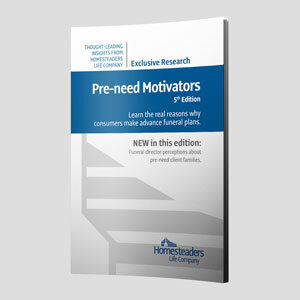 West Des Moines, Iowa — Homesteaders Life Company, a national leader in pre-need funeral funding, has announced the release of the fifth edition of Pre-need Motivators. This publication provides information about the demographics, behavior and experiences of people who arrange and fund funerals in advance. In addition to providing results from a biennial survey of policy owners who prearranged and funded funerals with Homesteaders, this edition of Pre-need Motivators includes information from a new survey of funeral directors. This study provides feedback about funeral directors’ experiences when pre-need arrangements become at-need funerals, as well as their perceptions about their client families’ motivations for prearranging. Pre-need Motivators is now available as a free download at homesteaderslife.com/motivators. Funeral professionals may request a printed copy of the publication by contacting their Homesteaders account executive.